LAUREL or HARDY: Babe was a star! One of my pet peeves is when people throw around terms like "never" and "always." For instance, it is often said that Babe Hardy was NEVER a star comedian before he teamed up with Stan Laurel. The above poster illustrates that Mr. Hardy certainly was a name above the title star comedian. Briefly, okay. Smaller company, yes I guess so. But none the less a star! ... so never say never and always use always sparingly. THE BOYCOTTED BABY was released January 4, 1917 by Vim Comedies. 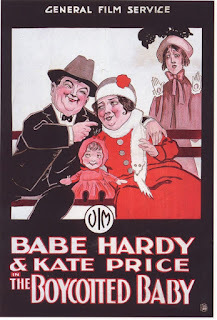 One of the last Vim comedies produced before what had become known as the Babe Hardy Company filming unit would evolve into the King Bee Company. With the exception of Kate Price (who would go to work with Billy Ruge in the other half of the fractured Vim, Jaxon Comedies) most of those that regularly worked with Babe in the last days of Vim (Ethel Burton, Joe Cohen, Florence McLoughlin and Budd Ross) would also appear in the first of the Billy West comedies that King Bee would start producing in early 1917. Hi Rob. Yes, it's annoying when it is said that he never was a star comedian before he teamed up with Stan. I'm glad this poster proofs them 'Wrong Again'! And what a lovely poster it is!! !